Climate change and increased drought in particular, reduces crop yields leading to reduced food and livelihood security. Insurance can unlock opportunities for farmers. It can mitigate the risk of new technologies or inputs, allowing farmers to increase their production or income without worrying about suffering losses or slipping into debt. However the complexity of reaching millions of small farms with limited income in remote locations has meant that insurance has traditionally been unavailable to the poorest farmers around the world. In recent years the picture has changed. New products such as index insurance (where compensation is linked to some externally measured index rather than on-farm yields) have removed the need for on farm visits. When complemented by new technologies such as remote sensing, this has made insurance potentially available to millions of farmers. In Sub-Saharan Africa, index insurance contracts now cover hundreds of thousands of farmers, adding to the tens of millions covered in India and China. At a farm or community level, insurance has to fit into the ever-shifting landscape of culture, context and farmers’ existing risk management strategies. Agricultural insurance is able to reduce poverty traps and allow farmers access to new agricultural technologies, but it equally has the power to entrench existing inequalities, leaving the most powerless even worse off. People also have many complex reasons for buying insurance that are as influenced by marketing and delivery as much as the product itself. If one wants to use insurance to achieve some goal (such as increasing the uptake of climate-adapted seed), then it is often necessary to have a holistic understanding of the farming system, rather than just studying an insurance product in isolation. Workshops to link the satellite rainfall community with the insurance industry. Workshops to link the agronomic and seed community with the insurance industry. Side events at the Bonn Climate Negotiations in May 2017, to bring together many of the insurance actors with policy makers. Presentations at the Royal Anthropological Institute’s conference on climate change in 2016. Collaborations with social scientists including those at the School of Agriculture, Policy and Development at the University of Reading in the United Kingdom. A series of research papers, building on examples and expertise from around the world, to build research frameworks and tools that provide an equity lens for insurance design. Integrated impact assessment: Most existing randomized controlled trials of insurance have been conducted in artificial settings – where insurance was only provided as a treatment of the trial. Although this is valuable research, there is the possibility that this can miss some of the unintended consequences of a full scale insurance roll-out, for example the impact of marketing, the impact of insurance sales on supply chain mapping, and/or the effect of insurance on the fake seed trade. As part of this project, we are working with Pula Consulting to undertake a randomized controlled trial based assessment of an operational, commercial, bundled insurance product in Nigeria. We are working with the insurance industry to show the value of such an impact assessment and to develop our methods into a standard impact assessment protocol that can be applied in commercial insurance programs. 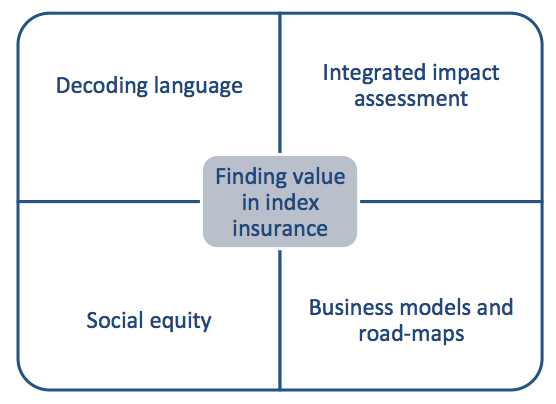 Business models and road maps: We are conducting novel research on the value networks behind insurance programs, their definitions of success and lessons learnt. This will be published as a paper later in 2018. Our project also looks for opportunities for insurance to help the uptake of CCAFS climate smart technologies, for example drought tolerant maize seed. Finally, we are also using CIMMYT expertise to improve measurement protocols for area yield insurance, in conjunction with the insurance industry. The project is jointly led between CIMMYT and the International Research Institute for Climate and Society (IRI). We have strong links with the University of Reading’s School of Agriculture, Policy and Development who are leading much of the research on social equity. We are also working closely with insurance providers including Pula Consulting in Nigeria, the World Bank and ACRE Africa. Our research on insurance and the seed supply chain is in East Africa is led by the International Maize and Wheat Improvement Center (CIMMYT) in close collaboration with the Drought Tolerant Maize for Africa Seed Scaling (DTMASS) project. Gender research is at the heart of much of our research. One of the themes of this project is specifically to understand social equity and insurance. Much of our research on this has focused on the differing opportunities afforded to men and women and their differing needs and uses for index insurance. We also have an explicit gender focus within our impact assessment in Nigeria. As part of our research on business models, we are examining, alongside insurers, whether there are ways to increase the participation by women farmers in index insurance, for example customized products or marketing. For more information, please contact the Project Leaders, Jonathan Hellin (CIMMYT) at j.hellin@cgiar.org and Helen Greatrex (IRI) at greatrex@iri.columbia.edu.